For many years, irrevocable trusts have been structured for as grantor trusts, for income tax purposes, while still maintaining tax free status for estate tax purposes. A number of favorable IRS Revenue Rulings have solidified the irrevocable grantor trust power of substitution concept under IRC Section 675(4)(C). This concept allows a grantor to substitute assets of equal value for those already in the trust, without causing any of the asset value to be included in their gross estate for estate tax purposes. Rul. 85-13 was the first ruling which stated that a grantor of an irrevocable trust would be treated as owner of the trust assets only for income tax purposes but NOT for estate tax purposes. In Rul. 2004-64, IRS ruled that a grantor’s payment of income taxes on investment income of assets held in an irrevocable trust was NOT a taxable gift to the trust. In Rul. 2007-13, IRS ruled that a transfer of a life insurance policy from one irrevocable grantor trust to another irrevocable grantor trust would NOT violate the transfer for value rule. The death proceeds retained their income tax free character under IRC Section 101. Rul. 2008-22 was the first ruling to outline how a grantor trust with a Section 675(4)(C) power of substitution clause could be used so that a grantor could substitute assets of equal value for assets already held by the grantor’s irrevocable trust. The ruling stated that the trust assets would NOT be included in the grantor’s gross estate as a retained life interest under IRC Section 2036 and NOT be included as a power to alter, amend or revoke under IRC Section 2038. Finally, Rul. 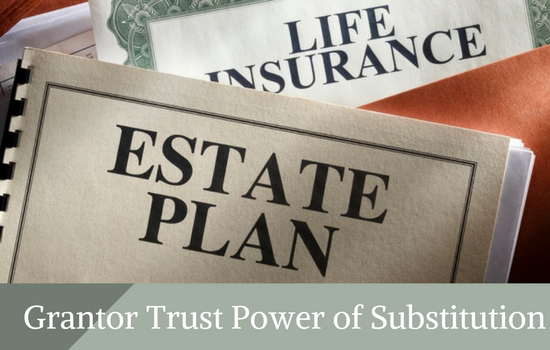 2011-28 ruled that the Section 675(4)(C) power of substitution would NOT cause life insurance owned by an grantor irrevocable life insurance trust to be included in the gross estate as an incident of ownership under IRC Section 2042. A gross estate well in excess of the estate tax exemption ($5.49 million single and $10.98 million married) so that the excess is subject to a 40% estate tax rate plus state death taxes in many states. Over the years, the estate owner has made significant gifts of capital assets in a gain position to a grantor irrevocable trust to remove future appreciation from the gross estate. 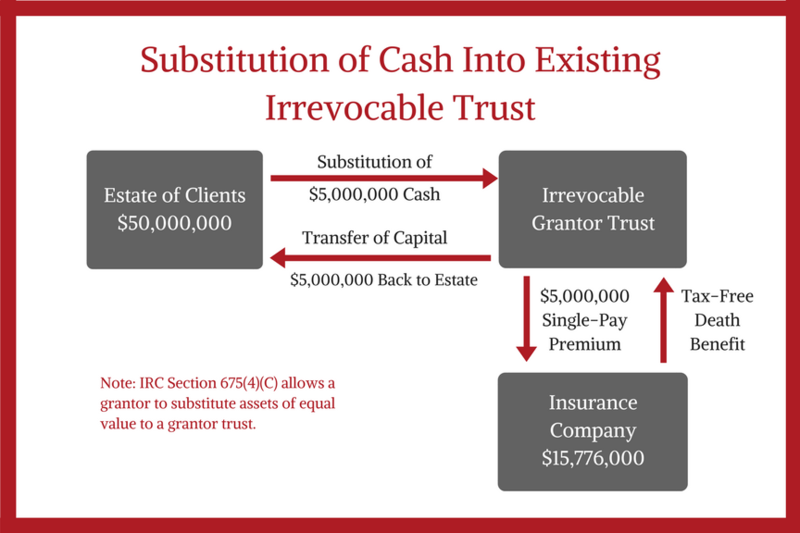 The grantor irrevocable trust contained a Section 675(4)(C) power of substitution clause. These were lifetime gift tax exemption gifts (currently $5.49 million single and $10.98 married). Form 709 U.S. Gift Tax returns were filed to document the gifts and their value. These gifted capital assets were real estate, publicly traded securities and shares in privately owned S Corps or LLCs. Under IRC Section 1015, the adjusted cost basis of these lifetime gifts carries-over and remains the cost basis for any future sale of those capital assets by the trust. This contrasts with capital assets included in the gross estate at death which would get a stepped-up basis to date of death value. The estate owner kept a part of his investment portfolios liquid in the form of significant money market account or bank holdings in an uncertain economic environment. Given this estate profile, are there any recommendations that could be made to improve the estate plan using the Section 675(4)(C) power of substitution clause of the grantor’s irrevocable trust? The grantor and his/her trustee could consider transferring money market cash to the trust as a substitute for a portion of the capital assets. This cash would have to equal the appraised fair market value of the capital assets now held by the trust. The capital assets would be returned to the grantor estate owner and would ultimately be included in the gross estate at stepped-up basis value for capital gains purposes for the heirs of the estate owner. The substituted cash could be used by the trustee to buy a single pay or annual pay no-lapse guaranteed UL or SUL policy owned by the trust. The leveraged death benefit of this policy would be income tax free, estate tax free and provide an excellent guaranteed Internal Rate of Return (IRR) at life expectancy. Let’s take a look at an example of how this may be beneficial to a wealthy estate owner who has a similar estate asset profile as that described above. Estate owner and spouse are each 67 years old and have a gross estate in excess of $50 million. They made lifetime exemption gifts of capital assets to a grantor irrevocable trust over the years totaling $5,000,000 with a cost basis of only $500,000. This $500,000 cost basis carried-over to the trust for purposes of any future sale. Form 709 U.S. Gift Tax returns were filed. The estate owner sold other personally owned real estate and the net after tax cash received on the sale was $6,000,000 which was deposited into a money market account. Their grantor irrevocable trust holding the gifted capital assets has a clause which permits asset substitution under IRC Section 675(4)(C). Grantor transfers $5,000,000 of cash from the money market account into the trust. The cost basis of this cash is $5,000,000. The trustee transfers $5,000,000 of capital assets that were originally gifted to the trust back to the grantor to complete the substitution transaction under Section 675(4)(C). If the grantor holds these capital assets until death, there will be a stepped-up basis to date of the death value. In a 25% combined federal and state capital gains bracket, this will potentially avoid at least $1,125,000 of capital gains taxes for the heirs of the grantor when compared to the original carry over basis of the lifetime exemption gifts ($5,000,000 minus $500,000 cost basis = $4,500,000 potential capital gain x 25% capital gains tax = $ 1,125,000). The trustee uses the $5,000,000 of substituted cash to purchase a single pay no-lapse SUL policy with a face amount of $15,776,000 (male 67-preferred / female 67-preferred) from a competitive carrier. The policy is a MEC, but death benefits of MECs are still income tax free. The death benefit is also estate tax free based on the rationale of Rev. Rul. 2011-28 which held that a Section 675(4)(C) power of substitution will NOT be considered to be an incident of ownership under IRC Section 2042. The guaranteed IRR on the SUL policy at joint life expectancy (23 years) is 5.12%. In a 30% tax bracket, the pre-tax equivalent is 7.31%. This is truly outstanding in this continuing low interest environment for fixed financial assets and a significant improvement over the close to 0% current yield on money market accounts. As an alternative, the $5,000,000 of substituted cash could be invested by the ILIT trustee in a portfolio of investments. Some of the interest, dividends or capital gains could be used to pay an annual no-lapse premium for an SUL policy instead. Since the trust is a grantor trust for income tax purposes, the grantor will report any income on his personal Form 1040 U.S. income tax return during lifetime. This payment of income taxes on trust income will indirectly reduce the grantor’s estate for estate tax purposes. So, the full gain on the trust investments will be retained by the trust and could be used to pay the annual SUL premiums. For instance, a $200,000 annual premium (4% ROR on $5,000,000 trust principal) would purchase $13,188,000 of SUL no-lapse protection on the same Male 67 (Preferred) / Female 67 (Preferred) as was illustrated in the single pay scenario above. The IRR at joint life expectancy (23 years) is 8.02%. In a 30% tax bracket, the pre-tax equivalent is 11.46%. In summary, the estate owner in the example above has avoided significant capital gains taxes for the heirs by using the substitution technique allowed for grantor trusts under IRC Section 675(4)(C). And the grantor trust has used the substituted cash to purchase a tax free guaranteed SUL for the benefit of the heirs with a great IRR at life expectancy. Call BSMG at 800-343-7772 today to discuss a case or feel free to reach out to Russ Towers, Vice President Business & Estate Planning directly.